Dental crown materials and treatment can be very costly, and many end up having to be redone due to data misinterpretation or failure to match shades accurately. The Smartshading AI app is a mobile application which uses machine learning and image processing techniques to shade patient’s teeth with improved accuracy. Evenset has partnered with Genoskwa Technologies to research possible solutions to enhance the accuracy of tooth shade colour matching process. Since these treatments can cost up to $2500, we concluded that with a combination of several image processing techniques, we can greatly improve procedure accuracy. As a result, Evenset has created a mobile application that is developed to detect the perfect shade match using a mobile device’s camera, and improves accuracy of colour matching by 80%. 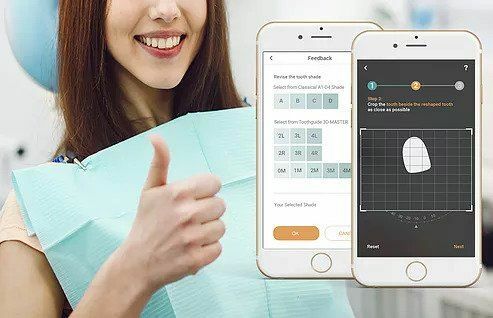 The app also collects critical information about the patient’s oral health, teeth size and translucency, and face shape and report it to the corresponding lab. Evenset is proud to provide the opportunity for dentists to use the technology for getting better, faster and more accurate results.